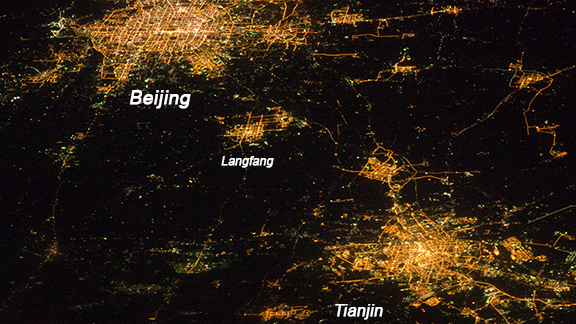 China Night Lights This nighttime image, taken by astronauts in the International Space Station, reveals dramatic land development over one area of northeastern China. Research shows that large urban areas such as these can have dramatic impacts on regional weather and climate. Photo courtesy of NASA Earth Observatory. Enlarge Image. Results: More cars, factories, heat, and pollution—these are some of the consequences of urbanization. Atmospheric researchers at Pacific Northwest National Laboratory found that the impact of urbanization around Beijing, China, creates two opposite regional effects, both of which govern seasonal rainfall in the area. Increased atmospheric particles—primarily from burning fossil fuels—work on clouds to decrease rainfall upwind of Beijing and increase downwind rain. Turns out this is a more powerful impact than the particles' direct effect—disrupting sunlight energy's journey to the surface. Another urbanization consequence is caused by the increased mass of heat-absorbing streets and buildings, creating a “heat island” around the city that warms up the surrounding atmosphere. They found this effect has a greater impact on temperature than precipitation. "Our study showed that the precipitation effect was the greater of the two urbanization impacts, through the ‘indirect effect’ of aerosol particles," said Dr. Yun Qian, atmospheric scientist at PNNL. "When we investigated the effects on one extreme rainfall event in the Greater Beijing Metropolitan Area, we found the urban heat island effect had less of an impact on rainfall." Why It Matters: China's urban population has doubled since 1990. More people in the city increases demand for services, housing, streets, and utilities. Often overlooked are changes to the environment and the atmosphere produced by removal of natural landscapes to make room for more buildings and streets. When natural land surfaces are replaced by streets, buildings, and highways, several environmental consequences follow. Think about a hot sidewalk on a midsummer's day. These structures store and convert heat, which increases the temperature of the air and surroundings. Called an "urban heat island" this effect has far-reaching impacts on temperature and heat waves for regional weather and climate. Heat Island Effect When natural vegetation is replaced by buildings and paved streets, the landscape is transformed into a solar sponge, storing heat and increasing evaporation rates. These significant changes alter meteorological conditions, such as wind patterns and surface temperatures. Depending on the size of the city, the urban surface temperature can be five times greater than a rural one. This phenomenon is known as the “urban heat island” effect. 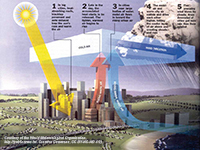 Image courtesy of the World Meteorological Organization. Enlarge Image. This rapid growth, caused by moving people from rural to urban areas, also means increased urban pollution. Beijing has experienced a dramatic increase in pollution emissions from vehicles, electrical generation, and industrial plants in the last two decades. These emissions contain many tiny particles called aerosols that increase the number of smaller cloud droplets that are much slower to form rainfall. In this study, scientists found that between these two urbanization impacts, increased pollution particles and their influence on clouds has a greater influence over the regional climate. Understanding the effects could lead to better informed solutions for a changing climate. Methods: In this study, the research team conducted ensemble simulations with three one-way nested domains using the WRF-Chem meteorological model coupled with a single-layer Urban Canopy Model. The model spatial resolution at 4 km can depict most clouds and cloud-aerosol interactions. They quantified the relative importance of the heat island effect and the aerosol-radiation-interaction and aerosol-cloud-interaction effects using four sets of sensitivity experiments, with 13 ensemble simulations run in each. 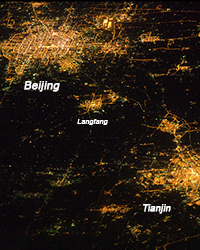 High-resolution urban area data were derived from the NASA satellite nighttime light products, used to detect urban boundaries and density. The study obtained human-caused emission datasets of aerosols and their precursors from the Asian emission inventory and China emission inventory. Their results show the aerosol-cloud interaction effect plays a dominant role in the region by modifying the Beijing rainfall pattern as aerosol particles suppress convection and rainfall in the upwind area and increase convection and rainfall in the downwind area. What's Next? This research was based on a single case study. Longer term studies will be necessary to capture the influence of land-cover change and atmospheric particles as they modify regional climates that have different large-scale influences. And, because the influence of aerosols may be dependent on atmospheric environmental conditions, further investigations are needed in other metropolitan areas with different weather conditions. Sponsors: This study is supported by the Department of Energy's Office of Science as part of the Atmospheric System Research (ASR) program and the Regional and Global Climate Modeling Program. Facility: This study used computing resources from the PNNL Institutional Computing program. Research Team: Shi Zhong, Yun Qian, Chun Zhao, Ruby Leung, PNNL; Xiu-Qun Yang, Nanjing University, China. In one sentence: Atmospheric researchers at Pacific Northwest National Laboratory found that the impact of urbanization around Beijing, China, creates two regional effects, both affecting seasonal rainfall with the increased aerosol particle-decreased rainfall effect dominating.